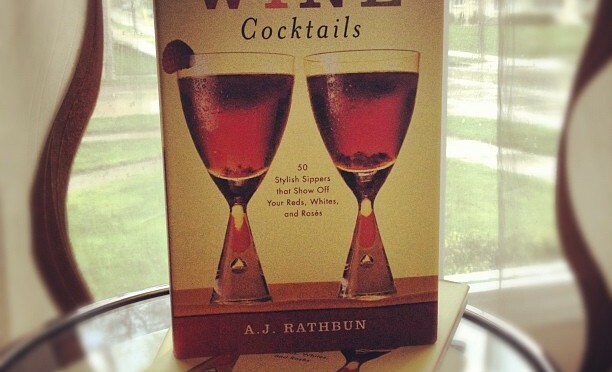 Being a wino, I just love his book, Wine Cocktails. Since the Summer season is upon us, there is no better time to start experimenting with your wine. I hope you enjoy this lil’ Q & A session. Happy Drinking! 1. What are some trends you’ve been seeing in the use of wine in cocktails in the United States? I think there’s been an influx of creativity in the usage of wine in cocktails and other drinks, which has been leading to both more interesting drink menus, and ones that include more wine cocktails. Until the last, oh, ten years in most spots the only drinks with wine on most menus would be Sangria and traditional Champagne and sparkling wine drinks such as the Mimosa and Bellini. But now, drinks that use wine and its relatives in shaken cocktails both as the base and as a secondary ingredients are popping up everywhere. Also, more home bartenders are serving up wine cocktails and an increased range of Champagne drinks. 2. What types of wine are being used more frequently? White, red, sparkling, sweet and dessert wines, aromatic and other fortified wines, etc. Sparkling and aromatic wines (I’m putting the vermouth family in here, as well as things like Lillet and Dubonnet) are used more often, as they’re more traditional and in more classic drinks, and also a little safer for both pro and home bartenders. But, on a percentage basis, the increase is across the wine family and perhaps even larger in those wines traditional drank solo: white, reds, desserts. Those wine family members haven’t been used a regularly, and now are being used more, even ones seen rarely in the past, such as port and sherry. I think when weighing out red and white, white may have a larger % increase, just because it wasn’t used hardly at all in mixed drinks and bartenders are now realizing how versatile it can be. 3. How are different types of wine used in cocktails? Why do mixologists use a specific wine rather than a liqueur or other spirit or another wine? As mentioned briefly, I think wines are being used both as a base spirit, so the main ingredient in a drink, and then mixed with fruits juices (always great with wine), other mixers such as ginger ale, as well as liqueurs and more. Also, wines are being used more as a secondary ingredient, mixed with gin, vodka, rum, and other bases. Champagne and sparkling wine also fit into the above, sometimes being the main player in a drink, but more and more being used to add that touch of sparkle and flair to a drink. As far as why a mixologist or bartender would use a specific wine, I would hope that in most cases it would be for taste reasons (as opposed to because they’ve been given a bottle, or think the name is catchy, etc) and for mixability and seasonality reasons. For example, when creating a summertime drink, white wines tend to go well both because they have a lighter, but flavorful taste, that won’t weigh you down but will still bring flavor to the shaker. So, as an example, take the C & C, from Wine Cocktails. I knew I wanted to create a drink that worked well with late summer favorites fresh raspberries and fresh mint, and wanted it to be a drink that was ideal for summer afternoon soirées. I picked a white French Chablis to play around with, because I thought would be light enough to play with the fresh fruit and herb, while not getting overwhelmed. After experimenting, I also added a touch of simple and syrup and Chambord (doubling up on the raspberry taste), and voila! Summertime deliciousness. I think that most good drink creators go through much the same process when using wine in cocktails. 4. What are some traditional ways wine is used versus new ways to incorporate it? I think in the past (and I touched on this a bit) it was usually solely used as a base spirit, and usually in built drinks (so, no shaken but either made in a pitcher or over ice)—unless you jump back to the first cocktail renaissance, when wine was used in a wider variety of drinks (I’m thinking late 1800s, early 1900s here). Today, wines and wine cousins are being used in shaken drinks, as accompaniments as well as main ingredients, and to add a touch of flavor in smaller amounts. Also, more of those older drinks alluded to are being re-discovered, which then influences new drinks. 5. What are some classic wine cocktails that are popular? There are a number of sparkling and Champagne cocktails that almost all cocktail lovers know, such as the Mimosa, the Bellini, and the Kir and Kir Royale, and then a few wine drinks such as the Sangria. If you move away from the States though, there are more wine-based drinks in regular rotation. For example, in Italy, the Spritz (which is a combination of Aperol and sparkling wine Prosecco) is known even in small hill town cafes and bars. Really, throughout Europe wine has been mixed with fruits juices, liqueurs, and more forever. This has been another influence on the American wine cocktail resurgence, as more cocktail creators are traveling, and are being influenced by international drink menus. Hey, are you having a flashback to summers when those big grouchy kids were bringing you down, taking your hat, calling you squirt? Don’t let those memories tarnish your sunshiny afternoons and evenings. Remember two things and you’ll be able to relax in suitable summer fashion. First, those kids were just jealous (and would be even more so if they knew about the beautiful hot-weather bashes you have now), and second, you have the last laugh because you now know that the Squirt is a tall, refreshing, bubbly drink that goes with a backyard barbecue or luscious lawn party, or with sitting with that perfect person as the sun goes down in July. 1. Fill 2 highball glasses three-quarters full with ice cubes. Add 1 ounce maraschino liqueur and 3 ounces rosé to each glass. Stir briefly. 2. Fill each glass almost to the top with the chilled club soda. Stir again, a bit more than briefly. Drop a cherry on top and serve. Don’t be afraid: The Cactus Berry (a cousin of the margarita that’s taken a trip into a winery) doesn’t involve any small piercing thorns that might turn a south-of-the-border soirée into a quick trip to the local first-aid station for cheek stitching. This mix does have a bit of a bite, though, so you’ll want to ensure your safety by doing any sort of hat dancing, attempts at tangoing, or cactus scaling earlier in the evening. 1. Fill a cocktail shaker halfway full with ice cubes. Add the Merlot, white tequila, Cointreau, and lime juice. Shake exceedingly well (as if you were shaking cactus thorns from your hands). 2. Strain the mix into 2 cocktail glasses. Garnish with the lime slices and serve. This is one of my favorite wine cocktails – http://www.marthastewart.com/344586/prosecco-sangria?center=276959&gallery=275544&slide=283879 – Prosecco Sangria that is mainly based on peaches and nectarines. So refreshing in the summertime. The brandy adds a nice little punch too 🙂 Would love to win the book to get more ideas! Cheers! I love making mojitos with wine, especially on the weeknight when you want something with a little less punch than rum (I like a lot of rum in my mojitos, preferrably Malibu!). They are quick and easy – muddle lime wedges, mint leaves, a little bit of sugar to taste (use less if using a sweeter wine) and a bit of crushed ice. Then add ice cubes, wine, and top it off with a splash of sparkling water (lime flavored water makes it even better!). Mmmm…I think I need one tonight in the 90 degree weather we’re supposed to have!! Out of the 2 above, I will definitely be trying the Rose Squirt (I bet I will find a perfect rose at Solo Vino’s Rose tasting on Sunday!). It sounds delicious! Given that it’s sweltering out, and only the middle of May, I think I would go with that Rose Squirt. It sounds pretty tempting on this hot day! One of my favorite wine cocktails is the Kir Royale… it’s an old standard but always delicious. It’s made with champagne or a dry sparkling white with a little Chambord. Some like to add frozen or fresh raspberries. I’m not that fancy. It’s an excellent drink to start out the evening with or end a meal. OK. I could probably be persuaded to drink one right now – so it’s an anytime drink! Oh that Rose Squirt sounds very nice….ready for the weekend. 🙂 Great article, thanks for the recipes! Thanks Amanda,Maria,Melissa,Kate & JS for commenting. May you have a wonderful weekend! Do experiment with wine cocktails, it opens up a whole world of Summer fun! Sample Guest Swiller Article – COPY ME! I’m not a slacker. An imbiber, yes, but not a slacker. My day job event planning for a major non-profit in town kept me away from writing a red or white review last week. (Note: not drinking, just writing.) Please accept my heart-healthy apologies. Why does any of this matter? Because the grapes are going to get hit with wafting, salty seaside breezes influencing their flavor with hints of tartness and a slight dryness. Don’t get turned off by what I just said, this is a terrific Summer wine that’s just begging to be paired with grilled fish, or my favorite, pesto. Think about it: wine that is made near the seaside is probably best had with frutta di mare (literally translated, fruit of the sea, or seafood). Plus, “real” pesto hails from Genova, so it’s not coincidentally, a perfect marriage. So, let’s talk food pairing. I’d soooo dig this with sautéed calamari. Scusi in St. Paul has a nice dish of sautéed calamari that would pair well. This wine is so perfect for pasta with pesto, I cannot stand it. The lemony, refreshing dry-sweetness balances the smooth, herby, garlicy pesto sauce. Mmmmhmmmm. If you don’t grow your own basil, SHAME ON YOU! But, perhaps I’ll forgive you if you pick some up this Spring and use it to make your own pesto. Throw it in ice cube trays and freeze it for a rainy day. It’s pretty easy and it tastes so much better than pesto from a jar. If you’re real short on time, though, I really like Pesto alla Genova carried at Lund’s & Byerly’s stores. It’s a teeny-tiny jar for a whole lot of money but often it’s on sale for $8. Put it all in a blender and slowly drizzle in olive oil until you get a consistency you like. Toss it over your favorite pasta and grate some fresh Parmigiano Reggiano on top. 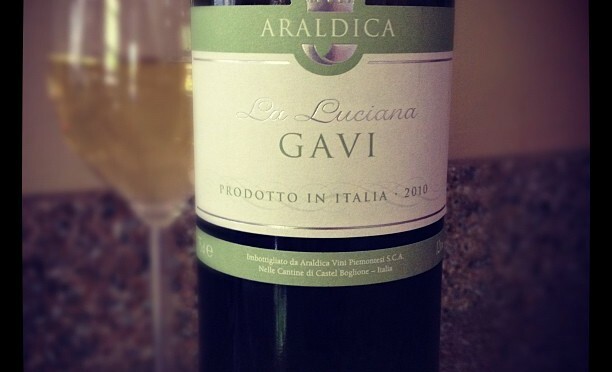 Pour yourself a glass of Gavi and you have a real meal. So simple, but the flavors will knock your socks off. No restaurant can give you that satisfaction, and we’ll just forget about last week.